The term alcoholism is used whenever people find that their drinking of alcohol has got out of hand and is no longer under their control. In mild cases the person finds that he/she has got to drink alcohol when returning from work in order to survive the evening. Such an individual might drink four glasses of wine in the evening in order to feel equipped to cope with the period before bedtime. It is well known that drinking alcohol at parties has the effect of increasing sociability. However, some people find that they need to consume large quantities of alcohol both prior to and during the party in order to be able to manage the social interaction involved. 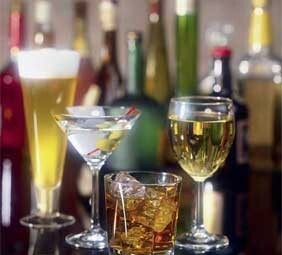 In more severe cases, the person needs to drink alcohol throughout the day, even first thing in the morning. The excuse given for early morning drinking is that it counteracts the hangover effect from the night before. Continuous heavy drinking of alcohol may lead to a number of complications for example liver damage, loss of sensation and weakness in the legs, and digestive disorders. There are a number of approaches to treatment which broadly speaking can be divided into two main groups. In the first group the aim of therapy is complete abstinence from alcohol and is the treatment of choice for severe alcoholism especially where there is evidence of physical illness, which is directly attributable to the alcohol. In the second group the aim of therapy is to ensure that the person will be able to continue drinking socially when the course of treatment has been completed. When the aim of the therapy is to ensure complete abstinence from alcohol this may be achieved with regular attendance at Alcoholics Anonymous (AA) and although this may be extremely helpful, some people are reluctant to attend such meetings. An alternative approach to abstinence is to use a technique called aversion therapy, which is carried out under hypnosis. In this form of treatment the suggestion is given that before any alcohol is drunk, the patient will feel nauseated. The aim of this method of treatment is to make the alcohol drinking unpleasant. Some therapists will prescribe medication, which produces nausea when combined with drinking alcohol but some alcoholics deliberately do not take the tablets because of this effect, or go on drinking regardless of the medication. This would indicate that hypnosis is likely to be a more effective form of treatment. If it is decided that the outcome of the treatment is to cure the patient of their compulsion to drink while retaining the ability to drink socially, this may be achieved in one of two ways. In the first the patient is introduced, with the aid of hypnosis, to increasingly difficult social situations in which they would usually find the need to drink. In order to achieve this, the patient is asked to imagine under hypnosis, the stressful situation and alternate this with a “special place”. An alternative method of treatment is to use psychotherapy, which involves examining the reasons behind the need to drink alcohol to excess. While this is an effective form of treatment, it requires regular treatment sessions on an ongoing basis over an extended period of time. David Kraft has been treating alcoholism for many years with a high success rate.